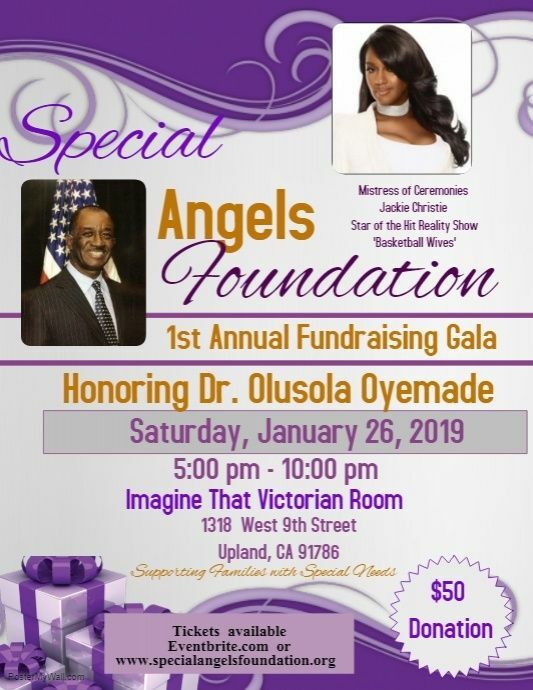 UPLAND, Calif. - Nov. 17, 2018 - PRLog -- he Special Angels Foundation will honor Olusola Oyemade, M.D., MPH, F.A.A.P., at its annual gala on January 26, 2019, at the beautiful Imagine That Victorian Room in Upland, CA. "I am deeply honored to receive this recognition from the Special Angels Foundation," said Dr. Oyemade. "I share and applaud their deep commitment and vision for healthy families through improved healthcare." We are honored to announce that Jackie Christie, star of the hit TV reality show, Basketball Wives: LA, and wife of retired Professional Basketball Player, Doug Christie, will be the MC for this event. Special Angels Foundation, Inc. provides mini-grants of up to $1,000 to families of special needs' children to purchase or assist in purchasing special equipment or access therapies. "Proceeds from this Gala will sustain and expand assistance to parents that struggle with the costs of raising a special needs child," says Crystal Carpenter, Founder of Special Angels Foundation. Every child is special and every special needs child deserves every opportunity to live their best life. No family should have to negate their child's future because of economic or financial lack.